Takahashi FSQ-106ED @ f/5.0 (530 mm F.L.) Captured at 2.1 arcsec/pixel. Shown at 2.86 and 9.14 arcsec/pixel. 90 min. (13 x 7 min.) "
210 min. (30 x 7 min.) "
eXcalibrator v4.30 for (u-g), (g-r) color balancing, using 15 stars from the SDSS-DR9 database. 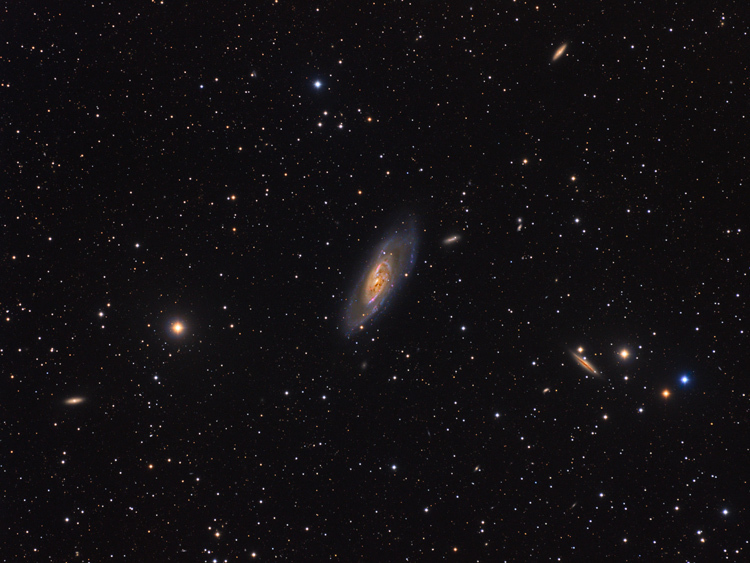 PixInsight processing includes registering and stacking the luminance, gradient repair, non-linear stretching with HistogramTransformation, LRGB creation and HDRMultiscaleTransform, with various layer counts, to selectively enhance the detail of the galaxies. Discovered by Pierre Méchain, in 1781, Messier 106 (also known as NGC 4258) is a spiral galaxy in the constellation Canes Venatici. M106 is at a distance of about 23 million light-years from Earth. It is also a Seyfert II galaxy, which means that due to x-rays and unusual emission lines detected, it is suspected that part of the galaxy is falling into a supermassive black hole in the center. NGC 4248, to the right, at a distance of about 21 million light-years is a possible companion galaxy.